Did you know that you are 475 times more likely to survive a plane crash than you are to click a banner ad? According to these statistics provided by online marketing research firm Solve Media, it’s obvious that run of the mill standard ad formats just won’t cut it anymore. People have wised up to general placement games – they know when and how they are being targeted during their web surfing sessions. Grabbing the attention of a modern audience brings up new obstacles. That’s where a successful native advertising campaign can breathe fresh life into a pay per click campaign. Native advertising is generated, paid content that has been creatively constructed and placed to flow naturally with the original content of a website. Native advertising has the potential to read much like an advertorial, which is written in the same tone and format as other scheduled content within a publication. Native advertising however, is subject to less rules and regulations concerning how they must be labeled online like other ads. When thoughtfully designed and implemented, native ads often pass as organic content to the untrained eye. For this reason, successful native advertising campaigns have the potential to generate strong brand awareness by generating clicks, shares and comments for the advertisers. This kind of content is much more likely to encourage audience engagement, and click-through-rates are typically stronger than average banner ads. Nearly half of all consumers are unaware of native advertising’s existence. 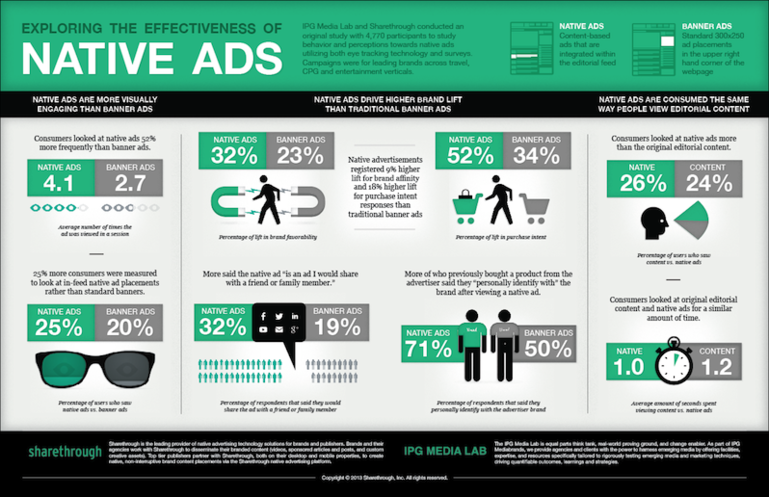 Of the consumers who are familiar with native advertising, more then 50 percent are skeptical of the ads presented to them. Three out of four online publishers are currently offering some kind of native advertising on their websites. 90 percent of publishers have either already launched, or plan to launch some form of native advertising campaigns in the near future. More than 40 percent of advertisers are using native advertising as part of a larger promotional strategy. As stated previously, effective native advertising campaigns are carefully crafted to appear to consumers as original content. As with any campaign, the ads should be informative as well as interesting and entertaining, but most importantly, they should sell the brand. Because building awareness is usually a central goal of any native advertising campaign, the tone, visual appearance and strategic placements are essential to the campaign’s success. Of course, native advertising isn’t something that is embraced without question. Many consumers are skeptical of the ads, and are resentful when they feel as though they are being “tricked” by ads that have been presented to them as website-generated content rather than something that has been paid for by an advertiser. Others say that native advertising threatens the integrity of true journalism, an enterprise that continues to experience significant transformations in the digital age. How does Native Advertising Fit into Content Marketing? Content marketing is all about creating and delivering relevant and consistent content that provides value to the consumer and promotes a certain action. When a native advertising campaign is thoughtfully designed to not only entertain, but also to deliver rich information to the consumer in the form of advertiser-generated content, it has the power to build brand awareness, drive clicks and encourage loyalty. Effective content marketing campaigns also possess a clear understanding of their audience. Native advertising should be applied similarly. When these paid ads blend in naturally with surrounding articles, the consumer will naturally engage, often before even realizing the type of content they are reading. If value is thought of first and foremost, the line becomes fine between content and ad. Who is using Native Advertising effectively? The brands reaping the biggest benefits from native advertising are those that have a clear idea of the audience they are trying to reach. Take this H&R Block campaign that was created to run on The Onion’s website as an example. The Onion, known for its entertaining, satirical look at current events and trends, was a perfect platform to reach young people who are new to preparing their own taxes without the help of mom and dad. By duplicating the same tone and spirit of an article that would regularly appear in the online publication, H&R Block was able to create a piece that poked fun at the tedious nature of preparing one’s own taxes online. The campaign not only generated clicks, but was also shared by hundreds of loyal readers. This entry was clearly labeled as a ‘sponsored post,’ however the content still had sharable qualities because it was highly entertaining and easy to digest. This effort supported H&R Block’s goal to build brand awareness, in this case among a specific target audience: younger people who may be doing their taxes on their own for the first time and who could likely use the help of a professional. By creating and delivering relevant, consistent and informative content through an ad filter, H&R Block was able to achieve their goal on numerous levels. As long as content is king, native advertising will have a strategic place alongside social media as a promotional tool of choice for brands. As more and more advertisers begin to utilize this tactic, however, native advertising faces the danger of burning out, or becoming as dull as the static banner that can’t even draw a click. It’s up to advertisers to continue doing the research to truly understand their audiences before taking the necessary steps to create content that not only provides entertainment, but also provides their readers with something useful.